Elisabeth Judson Shue (Wilmington, Delaware, 1963. október 6. –) amerikai színésznő. Ismertebb filmjei közé tartozik a Karate kölyök (1984), az Egy bébiszitter kalandjai (1987), a Koktél (1988) a Vissza a jövőbe-filmek második és harmadik része (1989, 1990), a Las Vegas, végállomás (1995), Az Angyal (1997), az Árnyék nélkül (2000) és a Bosszúvágy (2018). Szerepléseivel több díjat elnyert, pályafutása során Oscar-, valamint Golden Globe- és BAFTA-díjra is jelölték. A filmezés mellett televíziós sorozatokban is többször szerepelt: a CSI: A helyszínelők című drámasorozatban 2012 és 2015 között főszerepet alakított. Elisabeth Shue was born in Wilmington, Delaware, to Anne Brewster (Wells), who worked for the Chemical Banking Corporation, and James William Shue, a lawyer and real estate developer. She is of German and English ancestry, including descent from Mayflower passengers. Shue's parents divorced while she was in the fourth grade. Owing to the occupational demands of her parents, Shue and her siblings found plenty of time to get into trouble in their suburban neighborhood, but Elisabeth soon enrolled in Wellesley College, an all-female institution which kept her out of trouble. During her studies, she found a way to make a little extra money by acting in television commercials. Elisabeth became a common sight in ads for Burger King, DeBeers diamonds, and Hellman's mayonnaise. In 1984, she landed a role in the _The Karate Kid (1984)_ (qv) as the on-screen girlfriend of 'Ralph Macchio (I)' (qv) and a role as the teenage daughter of a military family in the short-lived series _"Call to Glory" (1984)_ (qv). At this time, Shue got herself an acting coach and transferred to Harvard, where she began studying political science. She continued her acting work with _Adventures in Babysitting (1987)_ (qv), _Cocktail (1988)_ (qv), _Soapdish (1991)_ (qv) and _The Marrying Man (1991)_ (qv). Unfortunately, time was catching up with the impressive girl-next-door. Her brother 'Andrew Shue' (qv) had almost eclipsed her own fame by landing a starring role in the hit TV series _"Melrose Place" (1992)_ (qv). It was at this time that Elisabeth took a chance on a low-budget, high-risk project entitled _Leaving Las Vegas (1995)_ (qv), directed by 'Mike Figgis' (qv). Her gutsy portrayal of a prostitute mixed up with a suicidal alcoholic paid off as she was recognized with a Best Actress nomination at the Academy Awards that year. This was the turning point of her career. What followed was a barrage of film roles, including _The Saint (1997)_ (qv), 'Woody Allen' (qv)'s _Deconstructing Harry (1997)_ (qv), _Palmetto (1998)_ (qv) and _Hollow Man (2000)_ (qv). Josh James Brolin (Santa Monica, Kalifornia, 1968. február 12. –) amerikai színész. 1985 óta játszik színházi, televíziós és filmszerepeket. Több filmes díjat kapott többek közt a W., Nem vénnek való vidék, Milk és a Tőzsdecápák – A pénz nem alszik című filmekben nyújtott alakításáért. Szerepel A félszemű című 2010-es amerikai westernfilmben is, amely Charles Portis 1968-as regényének adaptációja. Brolin 1968. február 12-én az Amerikai Egyesült Államokban, a kaliforniai Santa Monica városában született a Corpus Christiből származó Jane Cameron Agee környezetvédelmi aktivista és James Brolin színész gyermekeként. Brolin egy kaliforniai farmon nevelkedett kevés érdeklődéssel apja színészi karrierje iránt. 18 éves korában szülei elváltak. Mostohaanyja Barbra Streisand énekes-színésznő lett. Később a színházi szerepek kezdték érdekelni a gimnáziumi színházi osztály elvégzése után. Rugged features and a natural charm have worked for Josh Brolin, the son of actor 'James Brolin' (qv). He has recently seen a massive surge in his career, finding well-known roles such as a policeman, a hunter, and the President of the United States. Brolin was born February 12, 1968 in Santa Monica, California, to Jane Cameron (Agee), a Texas-born wildlife activist, and James Brolin. Josh was initially against the lifestyle of the entertainment business, in light of his parents' divorce, and both of them being actors. However during junior year in high school he took an acting class to see what it was like and played Stanley in "A Streetcar Named Desire" and became hooked. His first major screen role was as the older brother in the film _The Goonies (1985)_ (qv), based on a story by 'Steven Spielberg' (qv). He then immediately moved on to work on television, taking roles in such series as _Private Eye (1987) (TV)_ (qv) and _"The Young Riders" (1989)_ (qv). "Private Eye" was a chance for Brolin to play a detective. "The Young Riders" was set just before the Civil War, and was co-directed by Brolin's father, 'James Brolin' (qv). After _"The Young Riders" (1989)_ (qv), Brolin moved back to the big screen, with mediocre success. He played a supporting role in _The Road Killers (1994)_ (qv), but the film was not a hit. He followed up with the crime film _Gang in Blue (1996) (TV)_ (qv), the romantic film _Bed of Roses (1996)_ (qv), the thriller film _Nightwatch (1997)_ (qv), and appeared with his father in _My Brother's War (1997)_ (qv). However, nothing truly stuck out, especially not the box office flop _The Mod Squad (1999)_ (qv). The 2000s initially brought no significant change in Brolin's career. He appeared in the independent film _Slow Burn (2000) (V)_ (qv), the sci-if thriller _Hollow Man (2000)_ (qv) and starred in the television series _"Mister Sterling" (2003)_ (qv). In 2004, he married actress 'Diane Lane (I)' (qv) and, as of now, are still together. It was not until 2007 that Brolin received much acclaim for his films. He took a supporting role in the 'Quentin Tarantino' (qv)-written _Grindhouse (2007)_ (qv) which was a two-part film accounting two horror stories. He also played two policemen that year: a corrupt officer "Trupo" in the crime epic _American Gangster (2007)_ (qv), and an honest police chief in the emotional drama _In the Valley of Elah (2007)_ (qv) which starred 'Tommy Lee Jones' (qv) and was directed by 'Paul Haggis' (qv). However, it was his involvement in _No Country for Old Men (2007)_ (qv) that truly pushed him into the limelight. The film, directed by the Coen brothers, was about a man (Brolin) who finds a satchel containing two million dollars in cash. He is pursued by an unstoppable assassin ('Javier Bardem' (qv), who won an Oscar for his work) and his friend, a local sheriff ('Tommy Lee Jones' (qv)). The film won four Oscars, including Best Picture and Best Director. Brolin found high-profile work the next year, being cast as "Supervisor Dan White" in the film _Milk (2008/I)_ (qv). His performance as the weak and bitter politician earned him an Oscar nomination, and Brolin received more praise for his fascinating portrayal of 'George W. Bush' (qv) in the 'Oliver Stone (I)' (qv) film _W. (2008/I)_ (qv). Despite the mediocre success of _W. (2008/I)_ (qv), he was recognized as the best part of the film, and _Milk (2008/I)_ (qv) was another triumph, critically and commercially. Brolin then acted in the smaller comedy _Women in Trouble (2009)_ (qv) before landing a number of large roles in 2010. The first of these was the film based on the comic book figure _Jonah Hex (2010)_ (qv). The film was a box office flop and critically panned, but Brolin also forged a second collaboration with legendary director 'Oliver Stone (I)' (qv) for _Wall Street: Money Never Sleeps (2010)_ (qv). Brolin played a large role alongside such young stars as 'Carey Mulligan' (qv) and 'Shia LaBeouf' (qv), and older thespians such as 'Michael Douglas (I)' (qv), 'Eli Wallach' (qv), and 'Frank Langella' (qv). 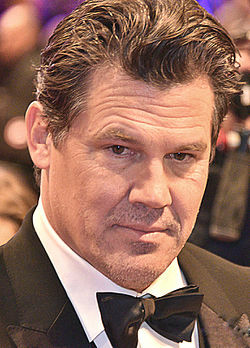 Brolin's character was "Bretton James", a top banker in the film, and also the film's chief antagonist. Brolin also appeared in 'Woody Allen' (qv)'s London-based film _You Will Meet a Tall Dark Stranger (2010)_ (qv) and a second collaboration with the Coen Brothers, which was a remake of _True Grit (1969)_ (qv). In the works for 2011 is a sequel for Brolin, the third "Men in Black" film, which will have the original stars coming back. Despite his earlier mediocre success and fame, Brolin has maintained a choosiness in his films and, recently, these choices have paid off profoundly. Hopefully, he continues this streak of good fortune that his talents have finally given him. Kevin Bacon (Philadelphia, Pennsylvania, 1958. július 8. –) Golden Globe-díjas amerikai színész. Kevin Bacon a pennsylvaniai Philadelphiában született 1958. július 8-án. Ő a legfiatalabb az 5 testvére mellett. Anyja, Ruth Hilda (született Holmes; 1916–1991), általános iskolában tanított és liberális aktivista volt, míg az apja, Edmund Bacon, építész volt. Bacon 17 évesen (1975) elment otthonról hogy felépítse színházi karrierjét New Yorkban, Circle-nél a Square Theater Schoolban. Elhatározása, hogy színész legyen nehezen jött össze. Filmdebütálása az 1978-as, Party zóná-ban volt, azonban nem vezetett azonnali hírnévhez, ami után vágyódott. A Search For Tomorrow (1979) és a The Guiding Light (1980–1981) című televíziós sorozatok néhány részében is szerepelt. Út a sikerhez[szerkesztés] 1982-ben nyert Obie díjat nyert a Forty-Deuce című darabért, ami utcai csalókról szólt, és hamarosan debütált a Slab Boysban, az akkor még ismeretlen Sean Penn-nel és Val Kilmer-rel. Ugyanebben az évben Barry Levinson Az étkezde című filmjében szerepelt olyan nagyszerű színészekkel, mint Steve Guttenberg, Daniel Stern, Mickey Rourke, Tim Daly és Ellen Barkin – A filmet Oscar-díjra jelölték a legjobb eredeti forgatókönyv kategóriában. Az étkezde lefesti 9 fiatalember életét az 1950-es évekből, akik nagyon jó barátok gyerekkoruk óta, ám életútjaik fokozatosan távolodnak egymástól. Messze a legcéltalanabb a csoportból a goromba, szarkasztikus Fenwick (Kevin Bacon). A filmben nyújtott alakítása hozzásegítette az 1984-es Footloose (Gumiláb) főszerepéhez, amely jegypénztárakat robbantott. A Herbert Ross által vezényelt zenés-táncos film bemutatja Ren McCormack történetét, a dörzsölt chicagói tizenéves (Bacon), aki anyjával egy iowai kisvárosba költözik, ahol a gimnáziumban megtetszik neki egy tiszteletes lázadó lánya. A tiszteletes és a város vezetői betiltottak mindenfajta zenét, táncot. A nagyvárosi fiú mégis úgy dönt megmutatja mi az az igazi rockzene. Bacon kétségkívül ezzel a filmmel robbant be a filmvilágba. Innen már azt hitte, hogy karrierje kezd felfelé menni. Karrierlanyhulás[szerkesztés] Bacon Az étkezde és a Footloose után választott szerepei saját megítélése szerint is visszavetették karrierjét az 1980-as évek végén, és az 1990-es évek elején. 1988-ban John Hughes rendező felkérte Bacont, hogy szerepeljen a Drágám, terhes vagyok! című vígjátékban Elizabeth McGovernnel. 1990-ben Baconnek volt két sikeresebb szerepe. Szerepet kapott a Tremors – Ahová lépek, ott szörny terem című horror-vígjátékban, Joel Schumacher Egyenesen át című, kissé horrorisztikus filmjében pedig egy orvostanhallgatót alakít, melyben néhány társával a halálközeli élményeket kutatják. 1991-ben Bacon társfőszereplő a Mondom vagy mondod című romantikus vígjátékban Elizabeth Perkins oldalán. A szerényebb siker ellenére a filmbeli szerep nagyon tanulságos volt Bacon számára. A visszatérés[szerkesztés] 1991-ben Bacon elkezdte feladni álmait. Ám Oliver Stone JFK - A nyitott dosszié című dokumentum-drámájában alakított szerepéért óriási tetszésnyilvánítást kapott a kritikusoktól. A filmben egy homoszexuális prostituáltat alakít. A szerep sikere felbátorította további karakterszerepek eljátszására, így elvállalta Jack Ross, egy hadseregben perlő ügyvéd szerepét az Egy becsületbeli ügy című filmben, a főszerepben játszó Tom Cruise és Jack Nicholson mellett. Ez a két film segítette, hogy szerepet kapjon a Veszélyes vizeken című akciófilmben. A filmben Meryl Streeppel játszott. A történetben Gail Hartman (Meryl Streep) és családja egy vadvízi evezésen vesznek részt, ahogyan Wade (Bacon) is, aki kezdetben flörtöl Streep karakterével azután barátkozik a fiával is, mindezt azért, hogy biztosítsa magának a szabadságát, ugyanis ő és haverja keresett bűnözők. Bacon alakítása annyira lenyűgöző volt, hogy Golden Globe-díjra jelölték a legjobb férfi mellékszereplő kategóriában. 1996-ban elnyerte a Broadcast Filmkritikusok Szövetsége-díját, Az őrület fészke (1995) című filmért. A film igaz történet alapján készült, mely Henri Young, egy jelentéktelen tolvaj drámáját meséli el, akit az Alcatrazba zártak, és egy sikertelen szökési kísérlet miatt három év magánzárkába kerül. Szabadulása után kivetkőzik magából, és megkeresi azt, aki ide juttatta. Folytatódó siker[szerkesztés] Bacon sikerszériája az Apollo 13-mal folytatódott, mely hatalmas kasszasiker volt. A film egy balul sikerült holdutazás igaz történetét meséli el, melyben Bacon Jack Swigert űrhajóst alakítja. Majd 1996-ban egy brutális és szadista javítóintézet felügyelőjeként volt látható a Sleepers - Pokoli leckében. Miután Az őrület fészkében, és a Pokoli lecke című filmben is negatív szerepet játszott, a következő évben inkább egy romantikus vígjátékban szerepelt (Mint-a-kép). Az 1998-as Vad vágyak című krimi-thrillerben nem csak szerepelt, hanem az ügyvezető-produceri székbe is beleült. Bacon horror/sci-fiben is kipróbálta magát, Paul Verhoeven, Árnyék nélkül (2000) című mozijában. Bacont megint lelkesen fogadták a sötét alakot játszó főszerepben, mint a 2004-es Az erdőlakóban. A lélek útjának a premierje az HBO-n 2009. február 21-én volt. Alakításáért megkapta eddigi karrierje legrangosabb díját: Golden Globe-díjat, mint a Legjobb férfi főszereplő (televíziós minisorozat vagy tévéfilm)-ben. Legújabb filmjei közt van a Fehér Elefánt és az X-Men: Az elsők, mely a mutánsok fiatalkori történetét meséli el. Magánélete[szerkesztés] 1988 óta él házasságban Kyra Sedgwick színésznővel. Két gyermekük született. Fiuk, Travis Bacon (1989. június 23-án), és lányuk Sosie Bacon (1992. március 15-én) Zenés karrierje[szerkesztés] Bacon nem csak a filmekben, hanem a zenében is nagyszerű. Testvérével Michael Baconnal 1995-ben megalapította a The Bacon Brothers-t, 6 albumot sikerült kiadniuk. A Couch Surf magyarul gyakran csak "kanapészörfnek" fordított kifejezés, ami arra az életmódra utal, amikor valaki baráttól barátig vándorol, és mindenhol eltölt néhány éjszakát, jellemzően a kanapén.